I received my preview copy of Allen Say’s upcoming book yesterday and can’t wait to carry it in the Store. Drawing from Memory is based on his 1979 novel, The Ink-Keeper’s Apprentice, which was essentially a biographical account of the defining moments of an artist as a young boy. I read Ink-Keeper’s Apprentice after buying El Chino for my four-year-old child. (I really bought it for myself, because I was blown away by the story of a Chinese American bullfighter!) I wanted to know more about the author and to find other books by him. The story captivated me in its stark, straight-forward examination of life of a pre-adolescent living in post war Japan. It was a story that was at once very extraordinary, yet surprisingly familiar. Drawing from Memory, the new book, is a fleshing out of Say’s story with the the talent which he has become best known for—his achingly beautiful paintings. 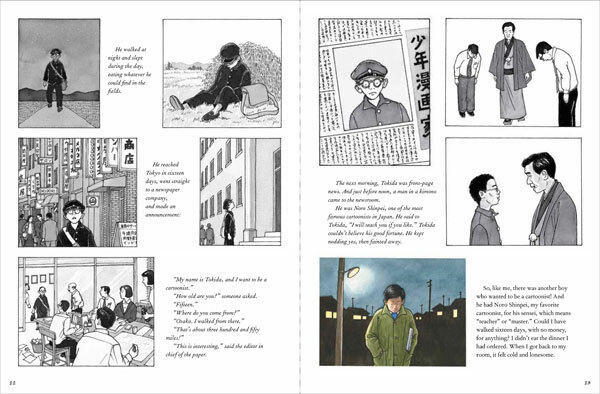 He tells the real stories behind the novel, shares pictures and details of his friends and beloved sensei, Noro Shinpei, and also frames a picture of life in post-war Japan. The visual look of this book shows the versatility of Say’s art—his command of color, line, framing, and storytelling—along with his keen sense of zen spareness. He knows how much is enough. Here’s a link to the promotion Scholastic is doing with 65,000 librarians. Click on non-fiction. You’ll have to wait through two other promos, but you’ll be rewarded with a sneak peak at Drawing from Memory.